SHEYKH OBEYD HEIRLOOM- Al Khamsa 100% EGYPTIAN Arabian Mare - 50% Pritzlaff/50% Doyle Egyptian with Rabanna of the Saqlawiyah-Jidraniyah (Sudan)strain. Ebony had her FIRST Heirloom, Sheykh Obeyd (Al Khamsa)female replacement by RG HILACIOUS AHR 225572 (Dahman-Shahwan Bedouin strain) in 2003. Ebonys Doyle LHF is a substantial mare standing a true 15.2hh. She is one of the most elegant, proportionate and substantial Sheykh Obeyd Heirloom Arabian mares carrying the RARE PRITZLAFF-DOYLE breeding combination with Rabanna. Her 2002 100% Egyptian ( Heirloom/ El Deree ) Sport Horse gelding, MSF EMIIR, by KAHREAM AHR 346222. Her 2003 daughter, MSF EBONYS DERBY is VERY special in many preservation respects, as RG Hilacious only has ONE male and ONE Female (MSF Ebony Derby) Heirloom replacement to date. 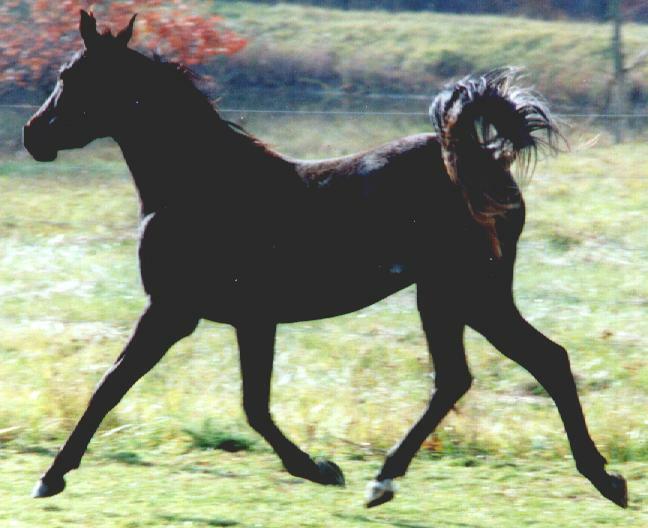 Her 2005 black daughter is sired by our special STRAIGHT BABSON EGYPTIAN black stallion, FAYDIN. Her name is MSF Ebonys Narmina, adding 50% Babson blood, again all Heirloom Sheykh Obeyd breeding. Ask for details about Heirloom, Sheykh Obeyd Egyptian Arabians. A special grand daughter of *Ansata Ibn Halima - Al Khamsa Pyramid Society Straight Egyptian Arabian, Sheykh Obeyd, Heirloom, Blue List Arabian Mare of Babson/Ansata/Pritzlaff bloodlines, of the Saqlawiyah-Jidraniyah (Sudan) strain. She had a 2002 filly, MSF NADIIMA by KAHREAM AHR 346222. Her only stallion son(2005) is MSF NADIR, sired by Pyramid Society Straight Egyptian, Straight Babson Egyptian, Sheikh Obeyd, Heirloom Black stallion, FAYDIN. CRF Nadira AHR 410566 possesses the regal and elegant look of the Saqlawi strain. Her sons & daughters are all Heirloom or Heirloom / El Deree group of Al Khamsa Arabians, all of Egyptian blood. See if one of these offspring will fit into your SE/SO Heirloom or Heirloom / El Deree programs. 1999 Rasmonet Salim AHR 578366 is a wonderful example of a strain family prized by the Egyptians, the Saqlawiyah - Jidraniyah (Ibn Sudan). Salim is "titled": Pyramid Society Straight Egyptian, Sheykh Obeyd, Heirloom Egyptian, Al Khamsa, Asil, Blue List ( eligible), & Saqlawiyah-Jidraniyah (Ibn Sudan) in strain in these groups. Heirloom - Horses classified as Heirloom carry only the Egypt I and Blunt Al Khamsa ancestral elements. The Heirloom Eqyptian Arabian herd derives exclusively from taproot horses defined as those Al Khamsa Foundation Horses exported from Arabia Deserta before 1914, from which the Root Mares and Root Stallions of the Royal Agricultural Society descend. We bred her to Black Straight Babson Pyramid Society Straight Egyptian Sheykh Obeyd, Blue List Heirloom stallion, FAYDIN producing a lovely 2005 chestnut mare, MSF Saaroufa, to add to this special Egyptian family. We bred her right back to Faydin, producing the black full sister, MSF Fadlima. One of her daughters will be offered to a special Sheykh Obeyd home. Presently Salim will be retained for our Heirloom breeding program. Purebred Arabian mares: Hart Asheera AHR 364456 & Alia Gamil Razele AHR 436527 were inspected and approved by the American Trakehner Association (www.americantrakehner.com) for inclusion in the Preliminary Stud Book for producing PUREBRED TRAKEHNER ( warmblood )horses. Alia Gamil Razele produced ALAQ LES MSF in 2002 (purebred Trakehner & 1/2 Arabian) rose grey stallion. Alia Gamil Razele & Hart Asheera's Anglo Arabian daughter, MSF Country Lane, bred by Mountain Spring Farm, sired by our TB retired race stallion, King Shamong were bred to Trakehner stallion, TZIGANE for 2005 with both mares producing fillies, ALTAIR MSF(1/2 Arabian & full Trakehner), & MSF CINDERINA (full Trakehner). Alia Gamil Razele AHR 436527 - Pyramid Society Egyptian Bred Arabian mare - El Hilal, Ruminaja Ali, *Sammara, + Crabbet (CMK) bloodlines. 1998 Rose Grey Arabian Mare - Pyramid Society Egyptian Bred - El Hilal, Ruminaja Ali, Shaikh Al Badi, *Sammara + Crabbet + old CMK bloodlines. MSF Habiba is a classic type Arabian mare. She is in Kansas getting started under saddle in hunter, and competitive Trail. She has a large dark eye, an exotic deep dished head, straight legs, excellent movement and will produce quality pure or partbred Arabians. Her dam Alia Gamil Razele was accepted into the ATA ( www.americantrakehner.com). MSF Amira Habib AHR 584652 is a rich blood bay having an iridescent sheen on her coat, showing a smooth body, elegant neck, exquisite head and correctness with size & type. We have shown MSF AMIRA HABIB successfully in Sport Horse classes, placing 2nd in most shows, against ALL mature Purebred Mares. She has since had an injury losing sight in one eye. MSF Amira Habib is an Al Khamsa mare, sired by MSF SHEIKH HABIB AHR 503970. Amira is a Pyramid Society Egyptian Bred, Al Khamsa Rare Element Arabian mare. MSF AMIRA HABIB can be bred to HOMOZYGOUS BLACK Straight Babson Egyptian Arabian stallion, BW FADL TALI 598701. 2001 Al Khamsa Purebred Arabian Pyramid Society Egyptian Bred filly, MSF NEFERTITI, sired by MSF SHEIKH HABIB AHR 503970. MSF Nefertiti is a black bay having a smooth body, elegant "hooky" neck, exquisite head and correctness with size & type. She is available to a (AHA) preservation home. She is due to be bred in 2011 or 2012(your choice) to HOMOZYGOUS BLACK Straight Babson Egyptian, Pyramid Society Straight Egyptian Al Khamsa stallion, BW FADL TALI 598701 since she produced a homozygous black replacement stallion, we hope she has a filly replacement next. Black Arabian stallion KAHREAM AHR 346222 is the sire of her 2004 HALF ARABIAN Sport Horse gelding, MSF DANZER. We bred her to HOMOZYGOUS Black Arabian stallion, BW FADL TALI producing 2005 MSF CINDER, Half-Arabian/Quarab Sport Horse mare. "Dakota" is a well built halter type APHA mare, with a fantastic background for overo markings. She has been trained western pleasure, handling the mountain trails,as well as being a lesson horse in hunter or western. 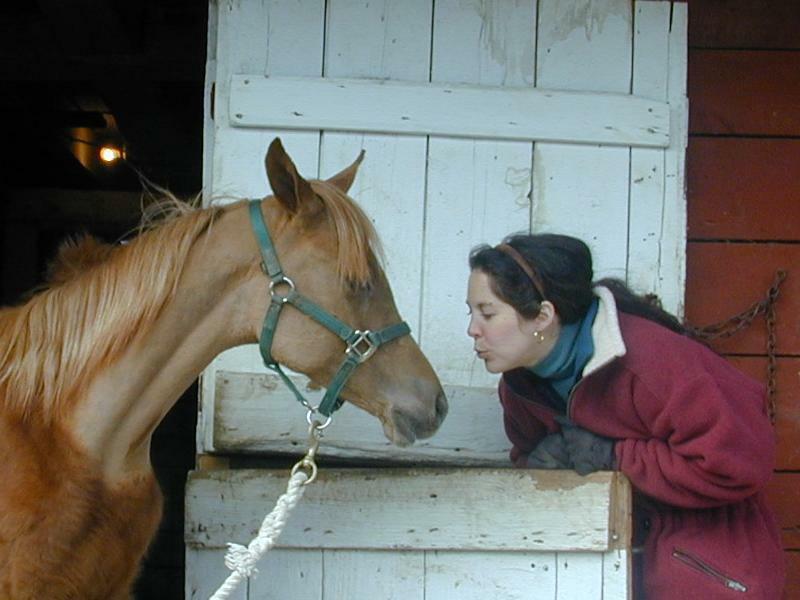 She has excellent stable manners for a family mount, and striking color with flaxen mane and tail, below saddle blanket minimal white markings and a blaze. Ask for new pics, as they change all of the time. Anglo-Arabian, MSF Gamila is ready to be added to any show string of horses for the Sport Horse classes in USA E, USDF or AHA. King Shamong(TB) has proven himself in the production of race winners, warmblood & Arab crosses and Sport Horses. He was a race winner for NINE years, retiring sound, and a producer of TB & QH race winners. MSF Gamila is a very black bay mare with no markings. 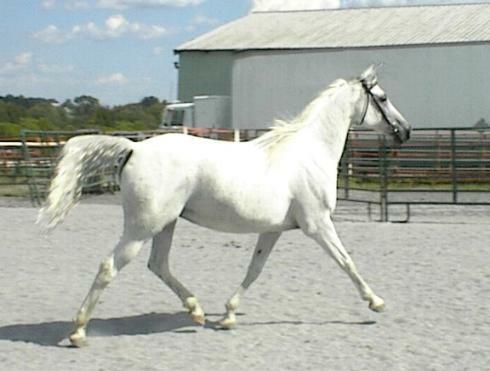 She has elegance for hunter or producing warmblood crosses. Special discount $5000, can be bred to one of our Sport Horse Arabian black stallions at the early bird discount for 2012. Isola Imagine is a lovely and fancy looking black bay mare. Her dam, Isola Katiana, is a daughter of our Trakehner mare, Isola Phoenix. Isola Phoenix moves effortlessly in a floating trot. Her daughter, Isola Katiana was free jumping over 4' on her own in our ring over PVC pipe balanced on a fence board & jump standard. Thoroughbred stallion, KING SHAMONG is the sire of MSF ISOLA IMAGINE. Imagine, called "GINA", is a candidate for hunter classes, lessons, hunting or USDF breeders series shows, if bred to one of our Arabian or Sport Horse stallions. This is a special breeding for the American Trakehner Association Pilot Program.... CURRENTLY priced at .. CALL FOR CURRENT PRICING. This elegant and large boned mare is a candidate for "A" hunter in hand or Sport Horse Breeding Program for AHA Half Arabian programs. She is an Anglo Sport Horse & can be bred to one of our Arabian stallions or we sell one of the mares, since both dams (Isola Katiana & Isola Covenant) were full sisters bred to our TB Stallion, King Shamong. Call for current pricing and availability. Show homes given preference.